The plantar fascia is located on the underside of the foot, and it is a thick band of fibrous tissue that runs from the inside edge of the heel to the toes. The plantar fascia provides support to the arch, and it is also a shock absorber. When the fascia is overloaded, pain can develop anywhere along the course of the plantar fascia, but most commonly the pain is located where the plantar fascia attaches to the inside edge of the heel. Risk factors to developing plantar fasciitis are tight calf muscles, flat feet or a recent increase in your activity level. Generally, pain is most commonly located at the inside edge of the heel and is worse with the first step in the morning. Usually, the pain will improve with movement, and then it can return after periods of rest (sleeping or sitting for long periods). Also, pain will generally occur with excessive weight bearing activities, and while walking barefoot or in shoes without any arch support (like flip flops or sandals). Plantar fasciitis pain typically does not wake one up at night, nor is it associated with the sensation of a pop or bruising on the underside of the foot. These symptoms are concerning for a plantar fascia rupture or a stress fracture in the heel. Evaluation by a sports medicine physician should include a complete history of the symptoms and a physical exam. The physician will likely evaluate how you walk, whether you have a flat or a high arch and if you have pain over your plantar fascia. In addition, the physician may extend your toes to see if this increases your pain, and check the flexibility of your calf muscles. If the physician is concerned about a stress fracture in the heel, he or she will squeeze your heel to see if this creates pain. Additionally, X-rays may be obtained, especially if there is a concern for a stress fracture. Lastly, the physician may use an ultrasound machine to look at the plantar fascia for signs of thickening or tearing. Treating plantar fasciitis usually involves multiple options. To begin with, many athletes require a decrease in training or activities that involve impact to the heel. During this time, athletes can usually participate in alternative pain-free cross-training activities. Athletes should also limit the amount of time spent walking barefoot or in sandals. A change in running shoes, or the use of heel cushions, arch supports or custom orthotics may be beneficial. Usually, a short course of anti-inflammatory medication like ibuprofen or naproxen is recommended. Physical therapy is almost always recommended, where treatments like ice massage directly on the plantar fascia and stretching the calf muscles and plantar fascia are commonly performed. Many physicians advocate for the use of a plantar fascia night splint, which helps to keep the tissue stretched out overnight. Finally, consideration may be given to a corticosteroid injection if the above measures have not been helpful. The most important thing is to seek evaluation by a sports medicine physician early in the course of your symptoms. Athletes should be sure to wear supportive footwear, gradually increase activity/training and monitor training surfaces. 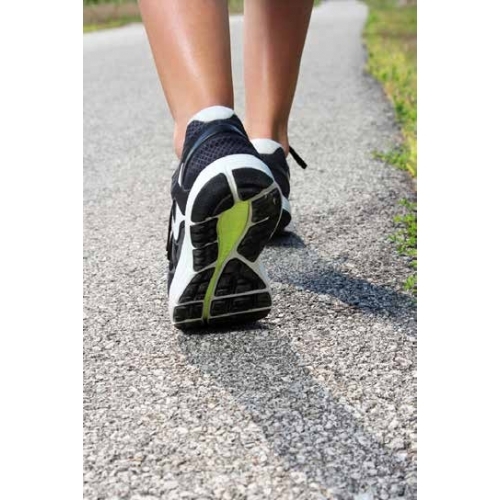 Treatment and return to sport after plantar fasciitis can be lengthy. Additionally, symptoms can return if training is resumed to early or quickly. The physician may recommend cross training with non-impact activities until the morning stiffness and pain is minimal. It is important not to train through pain, and to work closely with a physician to develop a gradual return to activity. 1. Dyck DD, Boyajian-O’Neill L a. Plantar fasciitis. Clin. J. Sport Med. management. J Am Acad Orthop Surg. 2014;22:372-380.